The multi-award winning husband and wife duo O’Shea are one of Australia’s most exciting musical exports. 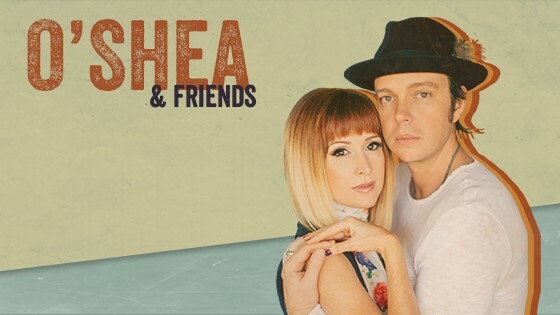 Based in Franklin for the last 3 years, O’Shea have graced some of the world's most famed stages, from the Grand Ole Opry to the Sydney Opera House, since beginning their musical journey together. Recipients of 7 CMAA Awards (The Australian equivalent of CMAs) and featured in CMTs Artist Discovery program, the duo are bringing together a who’s who of special guests for a night to remember with all proceeds from the show benefiting the fine arts program of Franklin Elementary School. Franklin Elementary is located near the heart of downtown Franklin and has been an integral part of the Franklin community since 1906. The staff embraces children of every culture and background believing this diversity gives the students a global perspective allowing them to recognize and appreciate differences, but in the same respect, understand there are many similarities in all cultures. Because 43% of the students at Franklin Elementary School come from impoverished homes, the school must rely on the support of the Franklin community to provide excellence in the fine arts programs. The staff of FES focus on educating the whole child and believe instruction in music and art to be key components in improving learning throughout all academic areas. Experiences in the arts also provide children with non-academic benefits such as promotion of self-esteem, motivation, cultural exposure and appreciation of diversity. Join O’Shea and Friends and help raise money for the art and music programs at Franklin Elementary School. facebook.com/therealoshea, instagram.com/therealoshea, twitter.com/therealoshea, or therealoshea.com. For more information on Franklin Elementary School, visit franklinelementaryschool.fssd.org or on Facebook, Instagram and Twitter.